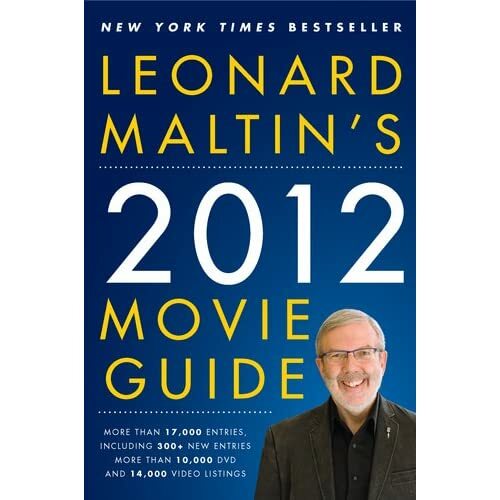 For Leonard Maltin, “part of the fun of creating the Movie Guide is knowing it helps steer people to good movies that may have flown under their radar,” and it's a feat he achieves yet again in the latest edition of his perennial digest of cinematic reference. Collaborating with his crack-team of passionate movie scribes, Maltin delivers 300 all-new capsule movie review entries in addition to the esteemed critic’s most ambitious “best list” in years by revealing an impressive collection of his personal favorite films of the new millennium in the 2012 tome. While it may have made more sense to ax the arbitrary collection of performers on the silver screen since it’s essentially a "Who’s Who" popularity contest rather than exorcising the director’s index, in the latest publication of the Guide, Maltin makes the difficult decision to forgo the filmmaker credentials to salvage 150 reviews for his loyal readership. And although I can’t help but wish that he would take some of the ‘under the radar fun of creating’ both the guide and his memorable must-see movie lists to build an all-new index that would help steer cineastes to quality titles as opposed to simply repeating actor data that’s not only readily available online but also repeated in the capsule reviews, Maltin’s Guide is as authoritative as ever. Furthermore, it might even benefit from an index listing works that received the highest ratings to help add to the feeling of interactivity in lieu of a keyboard – urging you to expand your horizons by looking up four-star films as opposed to four films with your favorite actor. A vital accessory for your home theater set-ups considering the far more diverse library of motion pictures available just a click away thanks to Roku players, Netflix streams, film festivals, online theatrical rentals in addition to on-demand DVD manufacturing of out-of-print classics – all of which give Turner Classic Movies a run for their money – Maltin’s exhaustive 2012 guide now boasts a know-it-all historical sidekick as well. Making up for the missing titles that were removed from the contemporary edition in favor of newer fare, Maltin opted to update his Classic Movie Guide for the first time since 2005, reflecting not only the rampant availability of some of filmdom’s forgotten vintage favorites but also ensuring that none of the capsules get lost in the shuffle of pages from present to past. Although Maltin and company still occasionally come up short when it comes to obscure art-house, foreign and limited distribution indie films, with roughly 17,000 entries, it's the closest thing to an all-inclusive reference guide this side of the information superhighway. Text ©2011, Film Intuition, LLC; All Rights Reserved. http://www.filmintuition.com Unauthorized Reproduction or Publication Elsewhere is Strictly Prohibited and in violation of the Digital Millennium Copyright Act. FTC Disclosure: Per standard professional practice, I received a review copy of this title in order to evaluate it for my readers, which had no impact whatsoever on whether or not it received a favorable or unfavorable critique.